Your Home in the town site Full of Golden Love! 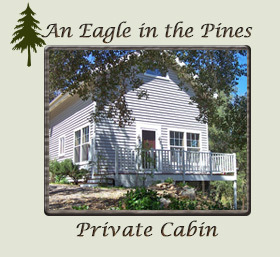 Perfectly nestled just a block above Main Street in the Historic District of Julian, California sits Eaglenest Bed & Breakfast, your Victorian Home Full of Golden Love and Beautiful Energy! 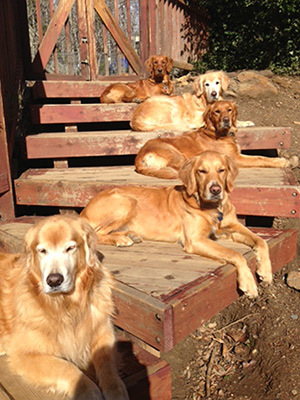 Your home, Eaglenest, is the only B&B Home in the town site of Julian, where Innkeepers and Golden Retrievers work to fulfill your every need and desire! The mountain hamlet of Julian in San Diego County is full of History, Beauty, Peace, Relaxation and Great Food! From your home, it is just a one block walk to many of the local shops, restaurants, bakeries, attractions and entertainment in the Historic District of Julian, CA! Eaglenest B&B offers Four Guestrooms that offer privacy, great amenities, quality furnishings and a high level of personalized service and care. Each guestroom provides great style and comfort, and features a range of amenities that include In-Room Fireplaces, Comfortable Seating, Entertainment Units, and Coffee and Tea Service. Additional amenities may include an Outdoor Patio, Patio with Views, a Private Entrance and/or an open Double Suite for extra space! You can expect a Golden Retriever or two (or three!) to check you in upon your arrival to the home, and we all come together for a Full Service Breakfast at 9:00 am every morning! Exploring the Historic Town Site of Julian and the surrounding areas will amaze you with possibilities. Whether you are visiting the Gold Mines, the Pioneer Museum, local Wineries, Galleries and the many shops around town, experiencing a Horse-Drawn Carriage out into the countryside, or treating yourself to Full Body Massages in the privacy of your guestroom, the opportunities are endless. And don't forget to try a piece of Famous Apple Pie from one of the many bakeries in town while simply relaxing your day away watching the people enjoying the world around you! The backcountry also offers you hundreds of miles of Hiking Trails in our County Parks, Open Space Preserves and State Parks that surround us! Be sure to spend some quality time communing with nature while celebrating life in Julian! Families with School-Aged Children are warmly welcome in guestrooms that can accommodate up to 3 and 4 people. *Extra Charges do apply.